If you have extensive practical experience in social work but no social work qualification, you may be eligible for registration under S13 of the Social Workers Registration Act. 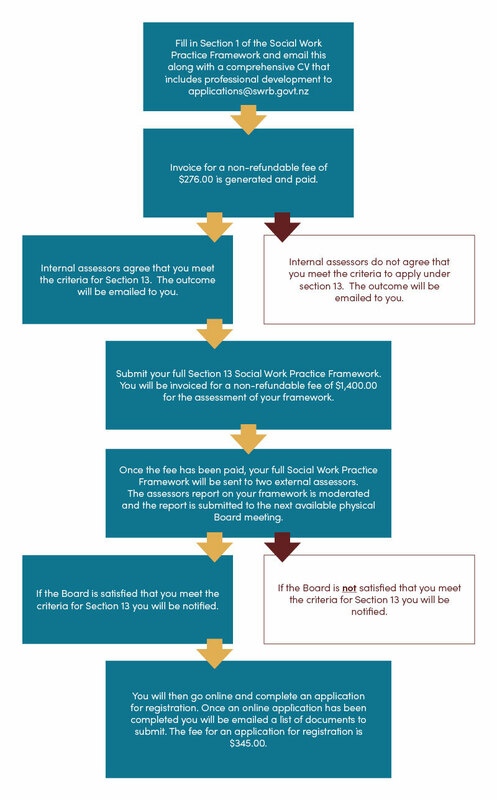 The Social Workers Registration Board (SWRB) considers each application for S13 registration on a case-by-case basis. Applicants are required to establish that their practical experience in practising social work in New Zealand is enough to compensate for the lack of a qualification. SWRB staff are available to provide assistance and clarification in preparing an application. Once you have passed both steps one and two your full S13 practice framework assessment will go to the Board for them to approve. Once approval is given you can go online to apply for registration as you would if you had a qualification. The fee to apply for registration is $345. Once your registration has been confirmed, you will also need to apply and pay for a Practising Certificate, which is renewed each year. The fee for a Practising Certificate is $368. What are these fees for and why? We have section 13 registration to recognise practitioners who have enough experience to compensate for not having a social work qualification. We do this using a two-step process. Firstly, section 1 of the framework is assessed to determine whether the amount of practical experience that someone has completed is sufficiently extensive to compensate for the lack of a social work qualification. Secondly, the assessment of the full practice framework addresses whether the applicant can demonstrate the knowledge that a degree graduate would have and whether they are able to apply that knowledge in their day to day practise. The fees are to cover the cost of this work which uses both internal SWRB (step 1) and external (step 2) assessors. This ensures we have a robust, independent and transparent process in place. When setting fees, the Board follows guidance from the Office of the Auditor General and Treasury. has participated in regular training and professional development relevant to social work in the course of their practice and that this training and professional development has developed their social work practice. application of that knowledge in examples of their practice. Happy Social Workers Day 20 March 2018! PO Box: 3452 - Level 6, 11 Chews Lane, Wellington 6140. © 2019 Social Workers Registration Board. Login to update your details or renew your APC.